TODAY'S GREEN MANTRA: "I will use eco / ethical shampoos and conditioners for my hair and the hair of all my loved ones to protect their health and the health of our planet"
I myself tried the "No Poo" movement last year, using baking soda as shampoo and apple cider vinegar as conditioner. After a few days of awkward greasiness, my hair transformed into something soft and silky, and, over our time in Texas it grew faster than it had in years, almost doubling in length in a matter of six months. I only stopped doing it because it was impractical when we were on our roadtrip where we showered in public pools. We switched then to Dr. Bronner's 18-In-One soap for everything, and, after being convinced by Dr. Bronner's Kid Rock look-a-like grandson in Encinitas, CA, bought their conditioning rinse and leave-in conditioner too. The whole set is biodegradable, so it meant we could get clean in creeks and rivers too. Since returning to Paris, I decided to try an eco shampoo brand from Denmark, and I've gotta say, my experience thus far has left me wanting .... or more accurately, left me greasin'. Because of this, I asked the Ethical Writer's Coalition and Florum Fashion Magazine what they use so you can avoid the nasties, do good for mama earth and get your hair shining like rapunzels without the failed attempts I've fallen accustom too (as soon as we finish this bottle of eco grease monkey shampoo, I'm moving back to no-poo pooing ). 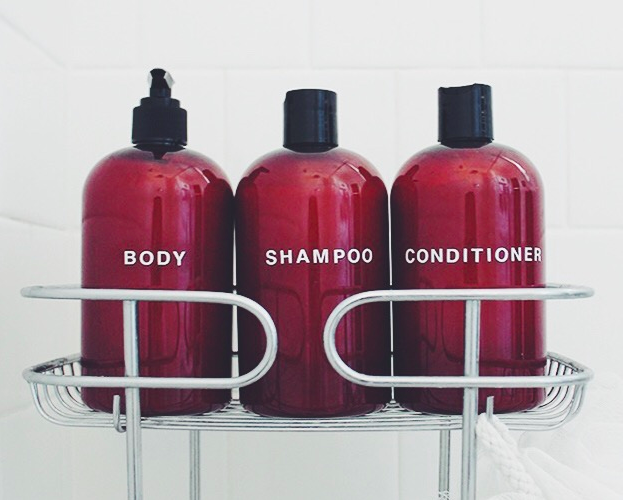 I've posted a list of health and earth harming ingredients at the bottom of this page which you can copy, save, or screengrab so you can avoid the harmful chemicals and choose an eco/health harm free product product next time you're shopping for shampoo. It's especially important that you ensure your children and babies are not using products containing the chemicals listed below as they are more susceptible to the health harms caused. The decision making process is made easier on the EWG website HERE, you can search brands you are using and see their ratings and read more on concerns of the particular brand you are interested in. They also have a search section for makeup, facial cleansers and exfoliators ect.. Affiliate Link: I signed up to Amazon Affiliates, so if you click through to buy any of the products linked in, they might throw me a few cents. I will donate half of any earnings I make to charity.